Kleefeld on Comics: Taxes Aren't Funny? 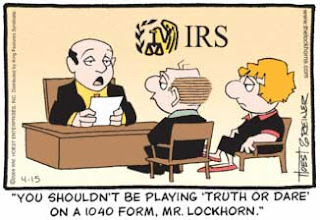 You know, I figured I'd have an easy post today and just collect all the tax-related comic strips, being as today is the last day to file 2008 taxes here in the U.S. You know what I've found? That's it. Apparently, taxes just aren't good comic strip material. Interesting, too, that the comics I did find are generally ones I don't read because of their tendency towards the banal. Hopefully, I'll have better luck next week with Earth Day.